ARTISANAL Spending time in the red city comes with its benefits. 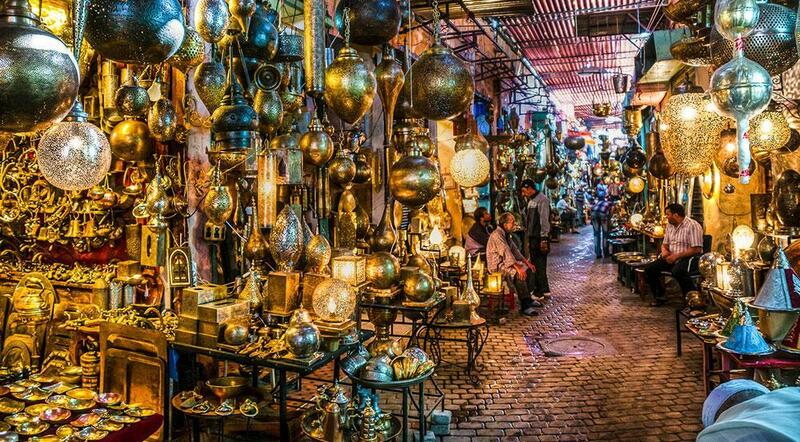 As you enjoy the Medina, you’ll stumble upon its range of souks; a place where craftsmen make a living by working with their hands and making daily pieces of art. There are currently 18 souks with more than 40 000 craftsmen and their trainees, passing down their knowledge to the next generation to maintain this noble profession. The souks are actually organized by the nature of work, as there are the blacksmiths in a souk, Babouche (traditional slippers) makers in another and the list goes on. 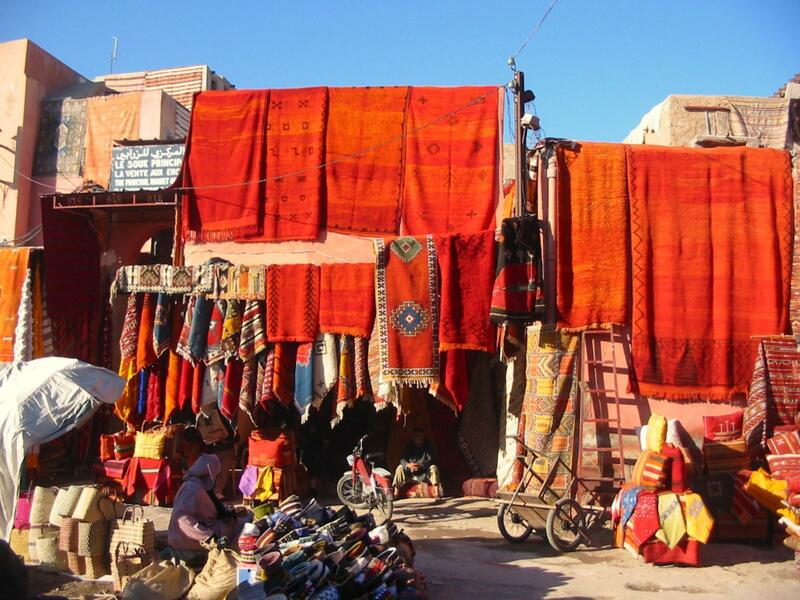 We will introduce you to some of the most beautiful souks, keep reading! The souk is located not too far from the Medersa Ben Youssef. 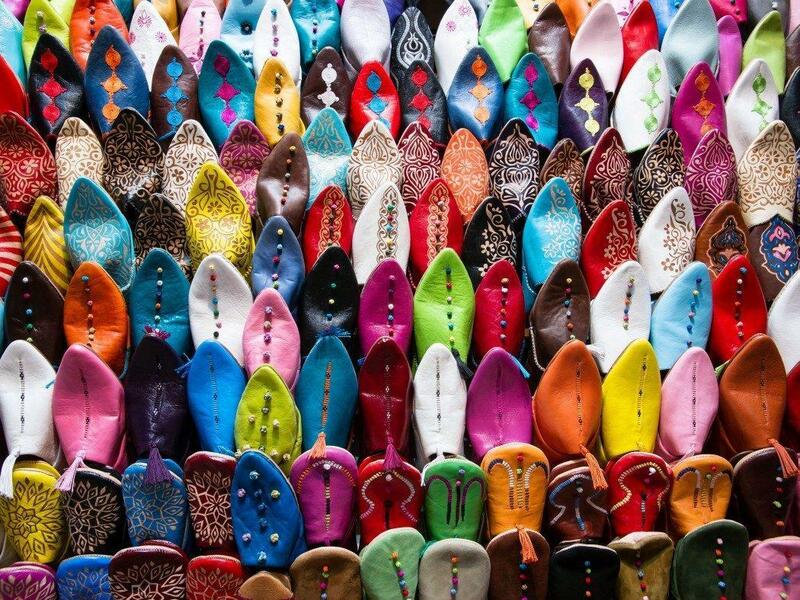 The perfect place to find a handmade traditional Moroccan slipper. It ranges from different material, colors, threads and leather soles. Whether you want a flashy colorful Babouche, or an embroidered one with flamboyant decoration. A few steps from the Smata Souk you will find the Attarine Souk. A place where bright colors is the main theme. From the little mountains of spices in different colors and smells, you can use them to brighten up your cooking and your palate; there is also the sheen of the brassware and their braziers working on making these unique articles. The two souks complement each other. 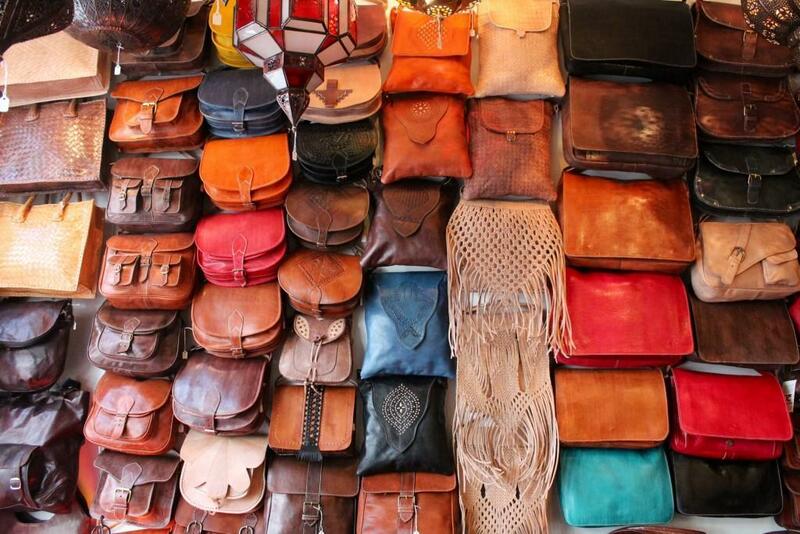 As you enter Souk Cherratine you will find the various leather bags, wallets, belts and so on. However when you are in Souk Serrajine, you’ll witness the few remaining saddlers in Morocco, working on the big leather boots, saddles and the list continues. Neighboring Souk Smata, you will find Souk Joutia-Zrabi. A collection of carpets coming from all over Morocco, if it’s not the region that is different, it’s the style, color or material that was used. Whether it is from Ouarzazat, Marrakech, Beni Ourain or even Taznak, a vast selection is available for you to choose from. If you are looking for a more expensive memento, this is the place for it. The selection of jewelry ranging from bracelets, necklaces to rings, from silver to gold, you get to make your pick. 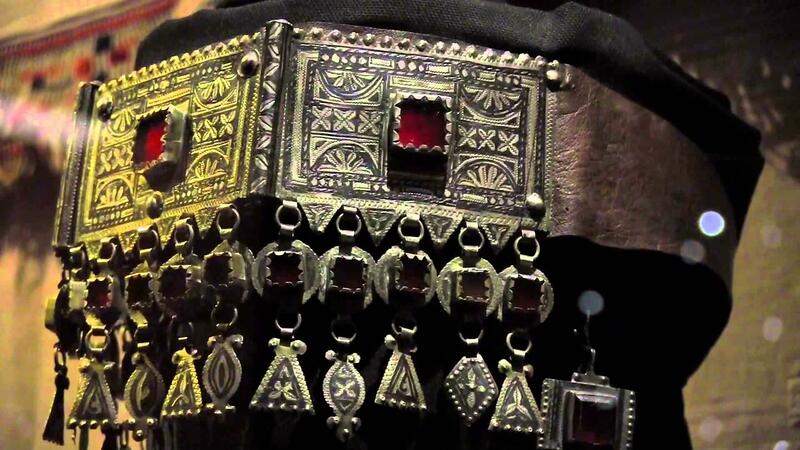 There is also the traditional Berber jewels and the antique articles from daggers, pots to kettles. Souk Chouari remains one of the souks with very pleasant display. 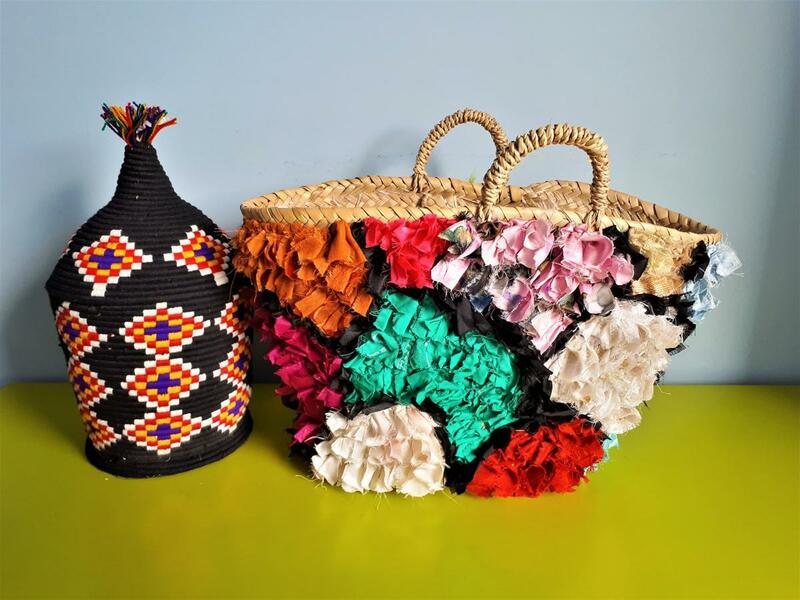 The way the weavers are making these remarkably detailed baskets, different colors and designs, it gives ideas of how you can brighten your interior décor. Without forgetting the woodturners. The culinary appliances solely from wood, that will add a soft touch to your kitchen set. A souk known for its peculiar name: Souk El Khemis, which translates to the Market of Thursday. It had its name for it being open on Thursdays. These dates have now changed to Thursdays and Sundays as well. 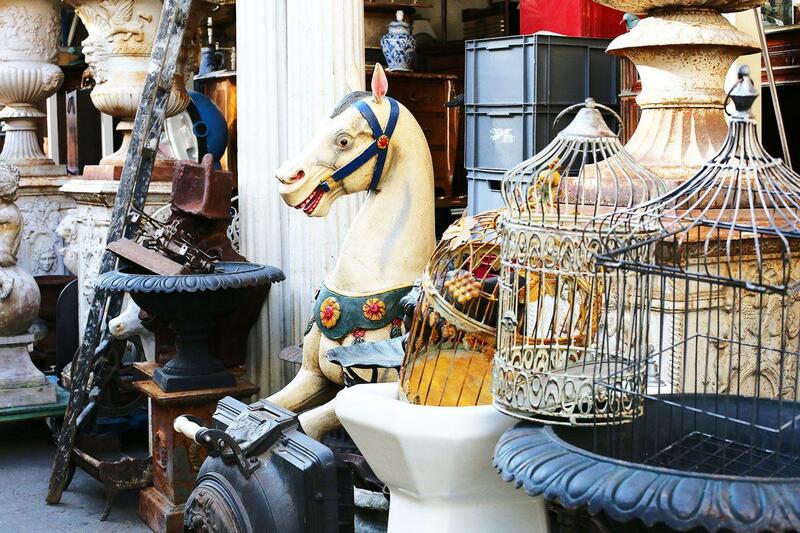 Souk El Khemis was a huge market for camels, now it has morphed to a flea market. If you have a good eye, you’ll find yourself with a unique article worth more than its original price. 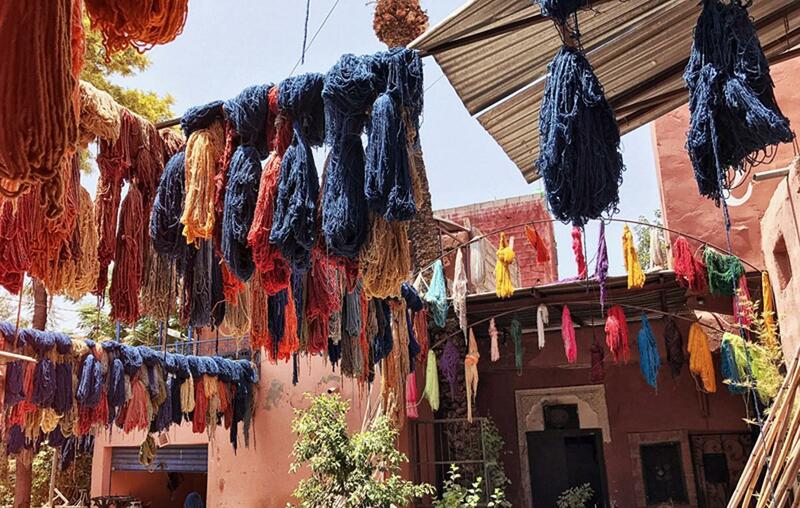 There are more modern and quick ways to dye different material of textile and leather, but in Souk Sebbaghine they have opted for the traditional way of dyeing. These craftsmen are diminishing in numbers, but the profession is still breathing in the Medina, you will still find their work drying off on the walls. 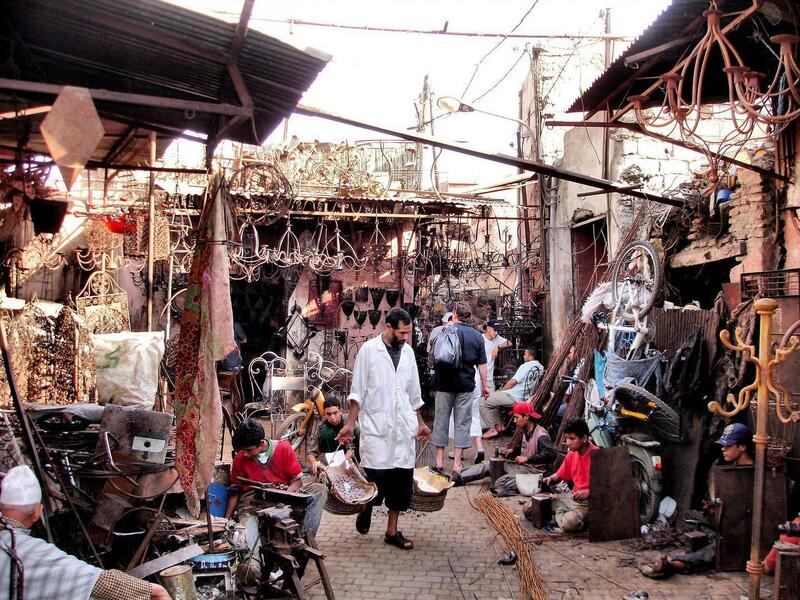 If you are in the market for a lantern or a set of table and chairs made of iron, this is the Souk for you. It has a rough atmosphere with loud noises of hammering and welding, but that is what’s charming about the Haddadine Souk. Their craft can be for utility or even for artistic production. 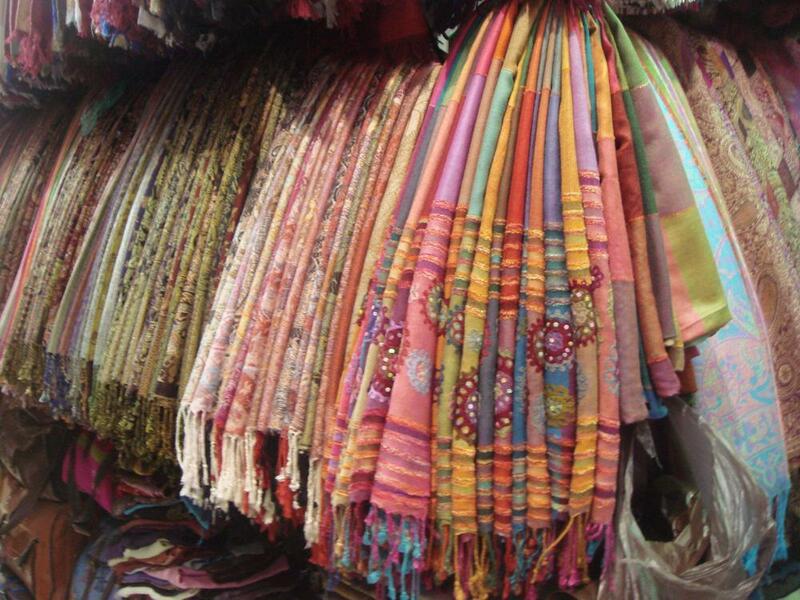 In this souk you will find multiple fabrics, whether it is cotton you are looking for, velvet or even silk. You would like to design your own or you would like to purchase premade articles, crafted in the traditional way: there is the Djellabas, curtains, scarves and so on. Or maybe you are in for a walk to just admire the craftsmanship.